DHA Bahawalpur Management announced land acquisition for Phase 2 from April 2018. In a media advertising management said that they have completed land acquisition as per their requirement and they thank full to landowners and land providers in this regard to meet the targets for DHA Bahawalpur. 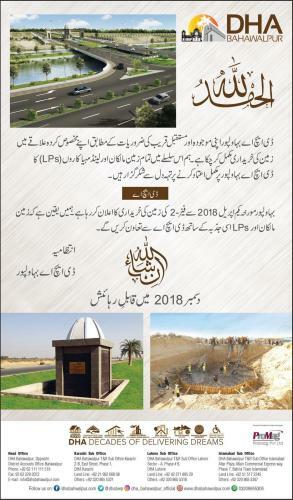 From April 1st, 2018 DHA Bahawalpur Management will start buying of land for DHA Bahawalpur Phase 2.